Amazing Fantasy #15 | "How Would You Fix...?" …why a Burglar traveled from Midtown Manhattan to suburban Queens? 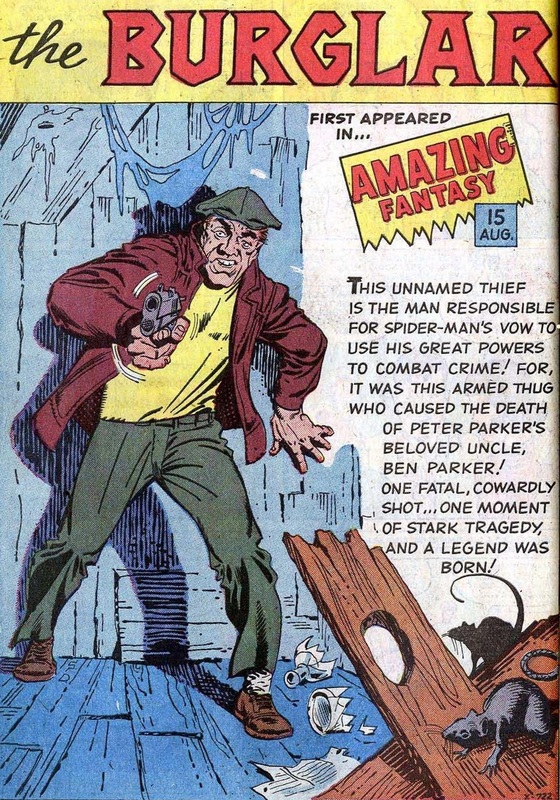 While considered a classic, Marv Wolfman’s “Dutch Malone” anniversary story in Amazing Spider-Man #200 represents a major lost opportunity in that it never effectively addressed the “Mother of All Coincidences” left over from the original story by Stan Lee and Steve Ditko in Amazing Fantasy #15 whereby an anonymous criminal who encounters Spider-Man in a TV Studio in Midtown Manhattan a few hours later comes completely by coincidence to the house in Queens where Spider-Man lives. And, remember, it’s not just the burglar… it was also the same cop, Captain Harrigan, in Manhattan and Queens. Heck of a precinct don’t you think! How is it that no writer – and out of all Marvel’s titles Spidey has had some of the best – has been able to come up with a simple, easy solution, a connection that makes it perfectly logical for all the necessary people to be in the right place(s) at the right time(s) without violating anything we already know? By saying “the burglar had stashed loot in the house” another layer of coincidence was merely added by Wolfman, rather than explained away. However, by saying: “Both the burglar and Captain Harrigan were from the Forest Hills/ Queens area,” we can assume that the burglar, having seen Spider-Man while casing the Parker house, made the trip to the TV Studio in Manhattan (followed by Harrigan, of course) for the purpose of finding Spider-Man there. It would seem to be the only reasonable explanation for why both he and Harrigan were so far from home (and also a reason why he’s “rifling through the dressing rooms”). Better to connect the Burglar to both Ben and Spider-Man, so that the coincidence element can finally be laid to rest. The coincidence is not that the guy robbing the Manhattan TV station improbably ends up robbing the Parker house in Queens, but that the guy casing out the Parker house in Queens surely turns up at the Manhattan TV station. With a connection to Spider-Man now established a priori, you have a reason for the burglar to be there even if not stated. So the burglar bursts into the house, clamouring for Spider-Man. They scuffle. The shot rings out. Uncle Ben is dead. If ever Aunt May had a reason to not like Spider-Man much before, she sure is given a doozy of one now! This would be an intentional underscoring of her feelings, like removing yet another coincidence from the Spider-Man mythos. Aunt May’s dislike of Spider-Man was obviously there to add one more thorn to poor Peter’s side – we always needed there to be something more to it than her just being gullible to buy the unsubstantiated twaddle J. Jonah Jameson was peddling in the Daily Bugle. This, for me, is it. …the complete Super-Soldier formula… set-up notes and everything… which makes the whole origin make sense. The burglar (doing a little freelance on the side) sees a kid with super-strength demolish a pro-wrestler three times his size. He steals the gate – but what he’s REALLY after is the sign-in-book (a good diversion, since everyone will think he’s just after the money). And he deliberately chooses his exit to get a close look at the kid. There he sees it, on the sign-in sheet: Peter Parker, Forest Hills. Bingo! His higher-ups immediately make the Richard Parker connection, and believe that young Parker has gotten hold of his Dad’s notes and given himself super-strength. Or maybe it’s Ben Parker’s doing. Doesn’t really matter! So he’s instructed to go after the notebook. He goes to the house, looks for the notebook, doesn’t find it (because it doesn’t exist); wakes up Ben. Ben recognises him, the thief shoots him. He scarpers. Thief is now on the lam for the murder. His higher ups decide to burn him since he didn’t get the formula. He’s terrified – not because of the New York cops, but because Ben has a file with both the FBI and CIA, if only because he’s Parker’s older brother – but also because he knows that he’s being chased by a super-powered teenager who might very well literally tear him limb from limb. This does, of course, complicate the simplicity of the original story – but a neatly tied bow, don’t you think? !